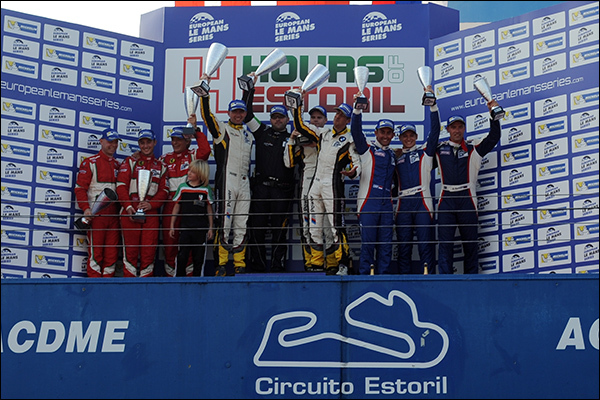 A thrilling conclusion to the 2014 European Le Mans Series played out in dramatic style at Estoril this afternoon. Signatech Alpine celebrated retaining their LMP2 title after a race that ebbed and flowed throughout a truly epic event. Despite two stop/go penalties, one of them for three minutes, Nelson Panciatici, Oliver Webb and Paul-Loup Chatin were crowned worthy champions after a fighting drive in to fifth place, where they collected the points needed to ward off Jota Sport, who finished in third place at Estoril this evening. The French team took both the drivers and team titles by just four points. It was no easy path for Les Bleues today. Despite a relatively quiet first hour of the race for the team when Nelson Panciatici and then Paul-Loup Chatin tailed the title chasing Jota Sport Zytek-Nissan, which started the race from pole but nine points adrift in the title fight. When Simon Dolan suffered some contact with Duncan Cameron’s #55 AF Corse and then went straight on at turn seven, after struggling with his brakes, significant chunks of time were lost and it looked like it would be a stroll for Signatech Alpine. However, what should have been a straight forward stop/go penalty for a pit-stop infringement (article 77.1.5.2 – one too many personnel changing tyres at pit stop) was further complicated when Oli Webb wheel-spun away from the penalty stop, breaking another regulation, and as a consequence being handed a more damaging three-minute stop/go penalty . While the title scrap took the majority of the headlines, there was a surprise but fully merited victory for Sebastien Loeb Racing’s Vincent Capillaire and Jimmy Erikkson, who enjoyed a flawless race to register the first LMP2 win for the team. 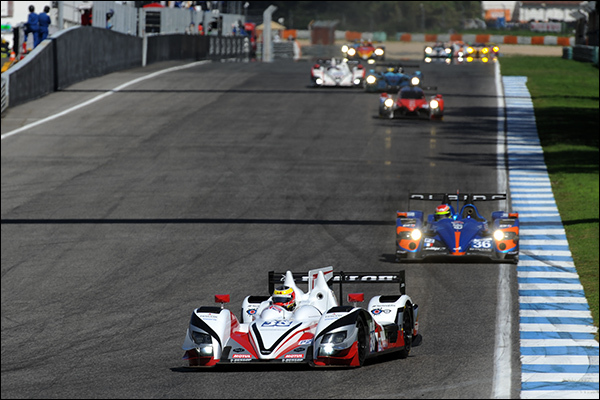 It meant that their well-deserved victory made it five winners from the five races in the ELMS this season. 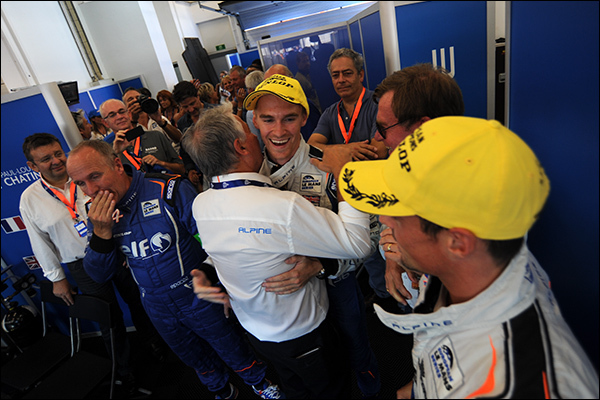 It was also the first LMP2 victory for a Michelin-shod LMP2 car. Taking second place at Estoril were New Blood by Morand, who should have been in a position to have a crack at the lead with their Morgan-Judd. However, Gary Hirsch had to make an extra pit stop to adjust his seatbelts after he entered the cockpit. Christian Klien drove his usual excellent stints but was unable to mount a challenge to the eventual winner. He did however ensure that he and his team mates – Hirsch and Pierre Ragues scored a third podium of the season. It was difficult to read the atmosphere down at Jota Sport. After such a fraught race, in which all three drivers gave it their all, an issue with the brakes ultimately cost them what would have been a fantastic double, after their epic Le Mans LMP2 victory in June. Despite another scintillating last stint from the undoubted star of 2014 – Harry Tincknell – there was just a little too much for Jota to do. Simon Dolan, a true bronze classified driver, made a valid point afterwards about the vagaries of the driver categorisation system, but was still gracious in defeat. It was, despite the intricacies of these issues, a good reflection of the spirit in which the drivers and teams have raced in 2014. Race Performance came home in fourth position, which on the one hand was a good result due to an enforced penalty when Franck Mailleux caused a red flag in qualifying. However, on the other hand, a late race spin for Michel Frey lost the Swiss team a likely podium finish. Patric Niederhauser returned to the team as if he had never left, adding poise and pace to the team all weekend. 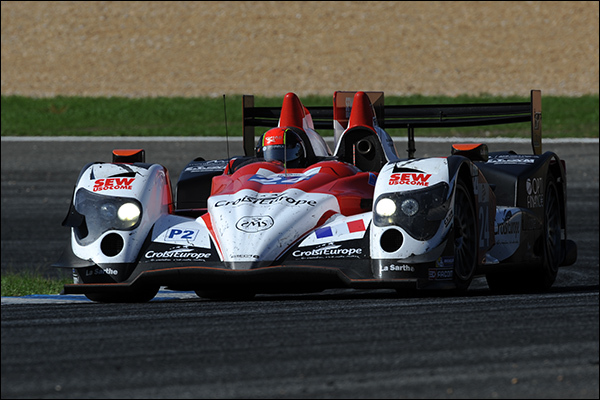 Murphy Prototypes finished a relatively quiet race in sixth position with their Oreca-Nissan. Pipo Derani showed some truly astonishing pace in his stints, setting fastest lap on a 1m32.854s. Ultimately though the tam were playing catch up after an earlier loss of time when Tony Wells had an off-track excursion. 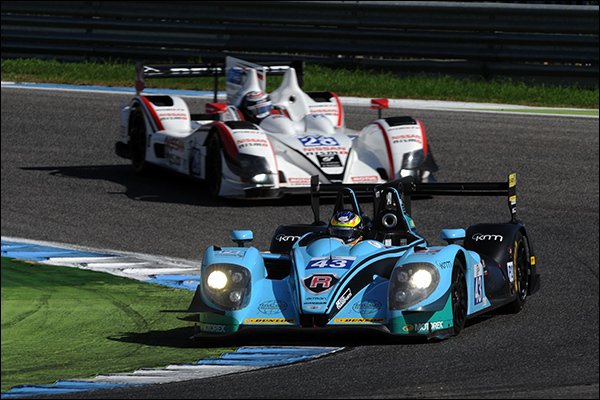 Greaves Motorsport saw eventful races for both of their entries with the #28 Zytek-Nissan initially running in third place after some feisty moves by Mark Shulzhitskiy. Sadly several problems ensured that although they typically fought hard right until the end, they were un-classified in the results. Thiriet by TDS again suffered reliability issues and registered a third consecutive retirement after an oil leak in the third hour. It was a massive shame because the Ligier-Nissan, particularly in the hands of Tristan Gommendy was easily the fastest car on track during the Frenchman’s stint. Leading the race at the time, Gommendy handed over to team mate Ludovic Badey but the coupe was soon smoking and returned terminally to the pits. The #41 Greaves entry of Matt McMurry, James Fletcher and Miguel Faisca placed seventh after a strong run from what surely must be the lowest average aged line-up to ever have raced in the series (one for Mr Wimpffen?). 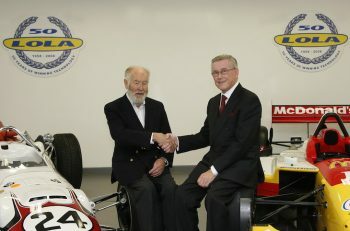 Faisca and Fletcher acquitted themselves very well with mature and eye-catching drives, despite having to serve a twenty second stop/go penalty for speeding in the pit lane. The LMGTE fight for title honours was just as intense as the LMP2 class. 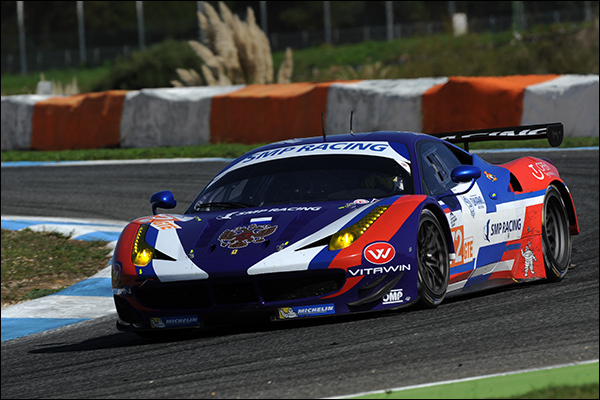 Taking the crown and overturning what seemed to be an impossible 21-point advantage were Andrea Bertolini, Viktor Shaitar and Sergey Zlobin in the #72 SMP Racing Ferrari 458 Italia. The critical moments really came early in the race when the #55 AF Corse of Duncan Cameron suffered damage after an incident with Karim Ajlani’s #99 ART McLaren. Six laps were lost while repairs were made and then further issues surfaced when Matt Griffin took over the car, meaning they were wide open to losing the title which was tantalisingly close to them after an otherwise excellent season. But it was Andrea Bertolini who hunted down the Gulf Racing Aston Martin in the final 45mins. The Aston Martin was in the lead after mesmeric stints by Daniel Brown and Stuart Hall, but the car eventually fell back to finish fifth in class just behind the fellow Gulf entry of Adam Carroll, Mike Wainwright and Ben Barker in the orange and blue Porsche 911 RSR, which again should great promise for bigger and better things in 2015. Bertolini was, in the final twenty minutes, forced to watch the gap to the second placed #54 AF Corse of Marco Cioci, Piergiuseppe Perrazini and Michael Lyons, as they attempted to pressure the SMP car. Cioci was hoping to assist the sister #55 car by taking the vital points off the Russian entered Ferrari but a brief charge eventually came to nought. Taking a fourth consecutive podium and signing off a brilliant season was the JMW Ferrari 458 Italia, Daniel McKenzie and George Richardson were always in contention in the first three hours of the race and with the returning Daniel Zampieiri finishing the race off, it was another very satisfying day for Jim McWhirter’s outfit. The GTC class championship was won by the #73 SMP Racing trio of Olivier Beretta, David Markozov and Anton Ladygin. It was a relatively straightforward run to the flag for the French/Russian alliance which delighted team owner Boris Rothenburg. “I am very happy for this result,” he said. 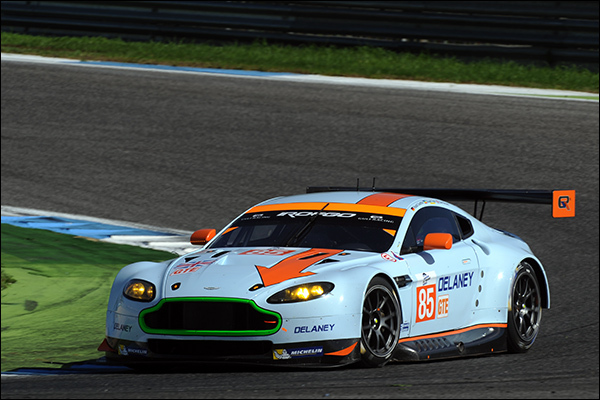 “We won GTC last season and now we have taken both LMGTE and GTC again. We have shown to be a truly international team this season and I would like to take this opportunity to thanks the whole team for this great achievement. 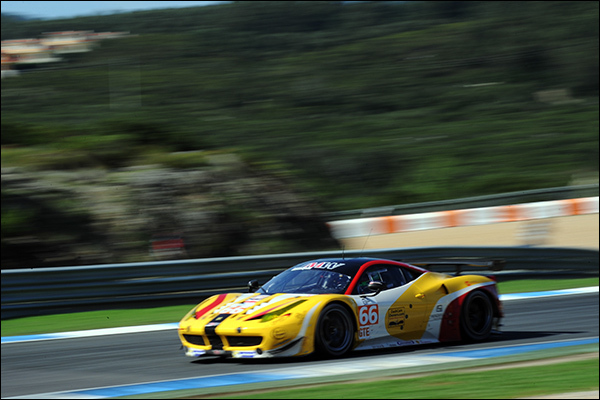 The GTC class victory today was taken by BMW Sport Trophy Marc VDS on their first visit to the ELMS. Markus Paltalla laid the foundations for the win early on despite a brief off-track incident with an LMP2 car. Henry Hassid and then Bas Leinders completed the victory with clean stints and controlled the race once Luca Persiani was forced to make a late pit stop in the #71 SMP Ferrari which eventually finished fourth in class. Formula Racing saw their slim chances of a title challenge take a nosedive in the first five minutes when Johnny Laursen spun the all-Danish crewed Ferrari. However, a fine comeback drive by Jan Magnussen and Mikkel Mac claimed a fourth podium of the year for the AF Corse run team. There was barley time to draw breath during a remarkable four hour finale which had more plot twists than a box-set of Dynasty! Here is to 2015. 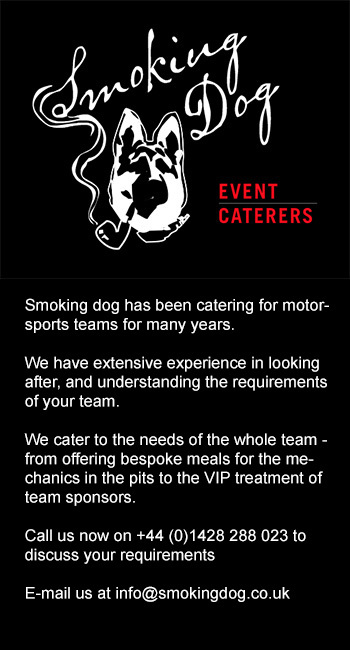 If it is half as good as the action of 2014 there will be a lot to look forward too when the teams reconvene at Silverstone next April.